APRIL FREE + REDUCED RATES!!! Select Apartment Homes, Restrictions Apply. Set on acres of lush landscaping and a beautiful Preserve, Somerset Palms offers you Apartments in Naples, Florida in Naples’ A+ School District! Relaxing by our resort style pool and working out in our state-of-the-art fitness center are just a couple of ways you can spend your leisure time when you make Somerset your new home. Our apartment community is professionally managed, with 24-hour maintenance and on-site management for your convenience. Visit Somerset Palms today to learn more about our North Naples apartments! Contact us today to schedule a tour! 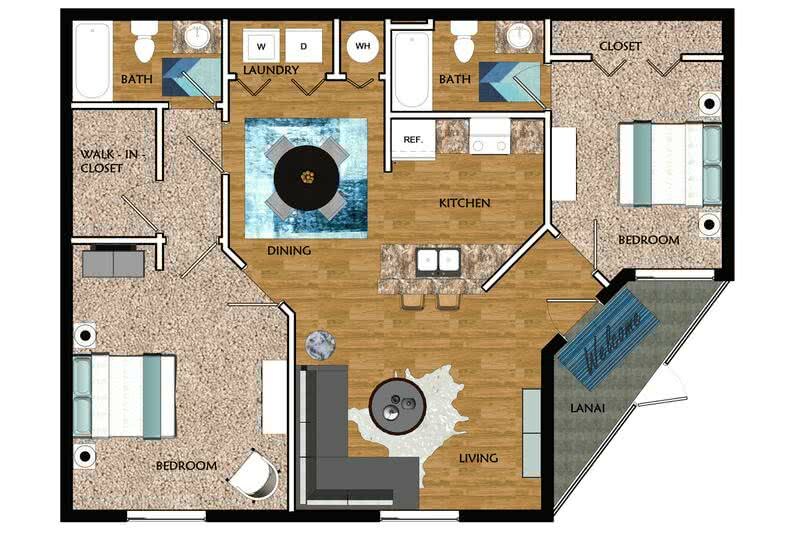 Somerset Palms offers you spacious two, three and four bedroom floor plans for rent in Naples. Our Naples, FL apartment community offers a wide array of great amenities, both inside and out. Apartments include modern kitchens with stainless steel appliances and breakfast bars, screened lanais, impressive master suites, laundry rooms with full-size washers and dryers, huge walk-in closets, large windows and pantries. All residents also have full access to the community’s expansive poolside sundeck with cabanas & Wi-Fi, 24-hour fitness center and yoga studio, and community grilling areas. Plus, Somerset Palms is a pet-friendly community, so be sure to bring your four-legged friends. Somerset Palms offers residents quick and convenient access to I-75 and US 41/Tamiami Trail, without all of the traffic hassles. Naples’ pristine beaches, restaurants, shopping, the Greyhound track and the area's best schools are all close-by to our apartment community. The Somerset Palms Apartments in North Naples is located near some of the area’s major businesses and employers, including the Hertz corporate offices, Arthrex & NCH. Be sure to ask about our preferred employer program to receive discounts! THIS COMMUNITY IS OWNED AND OPERATED BY AN AFFILIATE OF ASPEN SQUARE MANAGEMENT.THIS WEBSITE IS BEING PROVIDED AS A COURTESY FOR THE BENEFIT OF CURRENT AND FUTURE RESIDENTS.